People are turning to the internet and largely Google to find travel companies online. 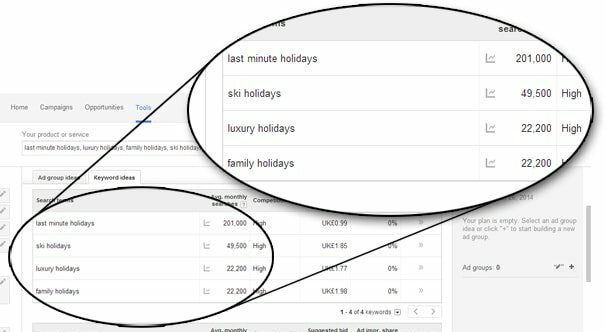 Each month 201,000 people use Google to search for the term ‘last minute holidays’ and a further 49,500 are searching for ‘ski holidays’. 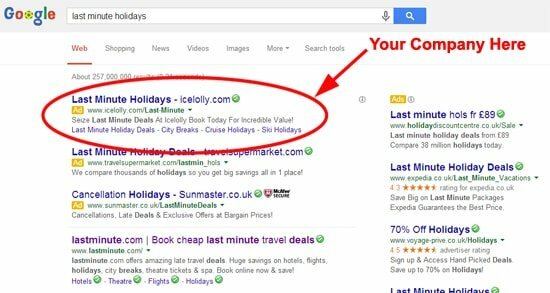 This proves that people are using Google to look for your services and with another 22,200 searching for both ‘luxury holidays’ and also ‘family holidays’ it is a competitive market. We at Trafiki are Google Partners and so have a fully qualified AdWords team and also exclusive access to a tool which enables us to see what people are searching for. The image below shows this tool in use and with our help we can help people find you. Pay Per Click advertising through systems like Google AdWords is by far the most cost effective, targeted advertising being used today. We can help you get ahead of your competitors and start earning revenue today. Each day on Google there is an incredible 5,922,000,000 searches performed each day which equates to 84% of the UK search market share! Potential customers in search of holidays and travel companies will use the internet to find deals and special offers rather than the old fashioned way of using magazines and Yellow pages. At Trafiki we are qualified Google Partners and this enables us to offer you £150 worth of free Google AdWords vouchers to any new clients who use our services. With our help we will generate you new business at a price which suits you. Call us today for more details on our travel companies AdWords offer. If you already have a Google AdWords account then we can undertake a free audit of the account to see how we may be able to help you improve it. A lot of people who try to do AdWords do not fully understand how it works and will spending a lot of money and not reaping the full benefits. Don’t just take our word for it. Talk to us now.